It’s the holidays and you may be looking for recipes to make your parties and meals extra special or for a gift of food to bless someone. I’m not suggesting anything that’s difficult or takes all day to prepare. After all, it is the busiest and most wonderful time of the year! I may have what you’re looking for right here on the blog. Go ahead and take a look around. May I suggest Noelie’s Pecan Pralines for a Christmas candy? How about Satisfying That Lox Bagel Craving or Fish Cakes Made With Sacalait (Crappie or White Perch) or Blackened Catfish Dip, Delta Meets Acadien for appetizers? You can bake this Fig Cake and ice it with the cinnamon whipped cream frosting for a delectable dessert. Have you tried the Bread Pudding With Pumpkin Pecan Praline Sauce or Pumpkin Cheesecake With Pecan Streusel, yet?There’s lots more to discover right here on this site. I found this recipe for Oatmeal Rolls years ago in a Country Woman Magazine. It has served our family well not only for the holidays but for whenever the need arises for some good comfort food. These rolls are different from your basic white yeast roll. They are warm and fluffy on the inside and have a slightly sweet, nutty oat taste. The first step is softening the oatmeal in water and butter for a minute. Then add brown sugar to sweeten the bread. There’s something about the combination of oats and brown sugar that warms the palate and the heart. Baking bread is as easy as 1-2-3. If you’ve never tried it before or haven’t done so in a while just follow these easy steps. Your friends and family will appreciate it and think you’re more awesome than you already are! After the oatmeal mixture is cooled add the rest of the ingredients. Adding a cup of flour at a time helps to incorporate it well. Knead the dough until it’s soft and not so sticky. Let the dough rise then take any frustrations you may have with the cat or dog out on it by punching it down before forming into rolls. Pinch the dough into halves four times making 8 little loaves then pinch each loaf into threes and there you have 24 perfect little rolls. It’s simple! Let the oatmeal rolls rise for a half hour or more in a warm place until doubled and baste with melted butter then sprinkle dry oats on top for garnish. A soft, fluffy yeast roll with a slightly sweet and nutty oat taste. The recipe is easy and the results make any meal special. In a saucepan, bring 2 cups of water to a boil. Add oatmeal and butter. Simmer for 1 minute. Remove to a large mixing bowl and let cool to 120-130 degrees (about 20 minutes). Add yeast to 1/3 cup warm water (120-130 degrees), stir and allow yeast to dissolve and react for a few minutes. 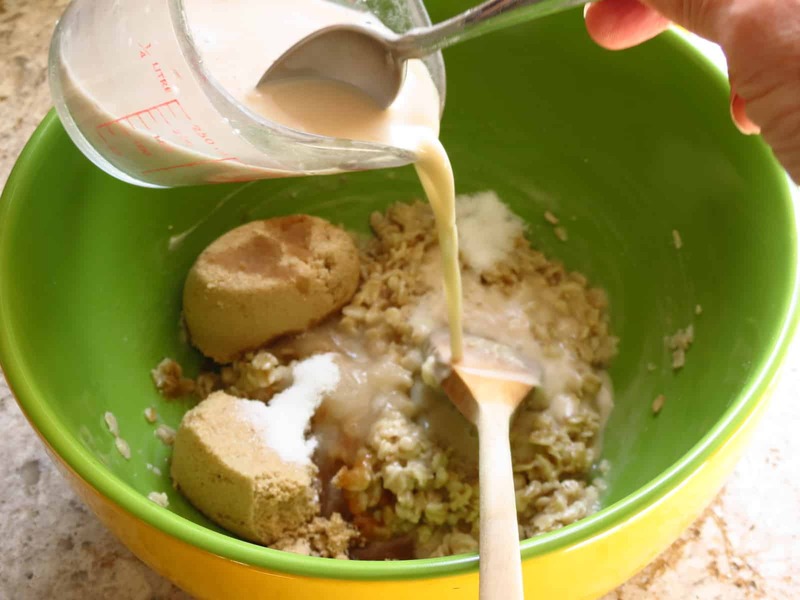 To the oatmeal mixture add brown sugar, white sugar, salt and yeast mixture. Add 4 cups of the flour one cup at a time. Mixing well to make a soft dough. Turn dough onto a floured board using that remaining cup of flour. Knead 6-8 minutes or until smooth. All of that last whole cup of flour may not be needed. Place dough in a greased bowl, turning once, and cover with tea towel or plastic wrap to let it rise for 1/2 to 1 hour. Punch dough down. Make 24 rolls and place into a greased pan. Let rise 1/2 to 1 hour in a warm place, covered. Bake at 350 degrees for 20 – 30 minutes. You may use instant yeast for a speedier process. It claims only one rising is needed before baking in half the time of regular dry yeast and it can be added directly to the recipe without hydrating in water. These rolls freeze well or can be taken out of the oven before they are browned to brown later right before serving.